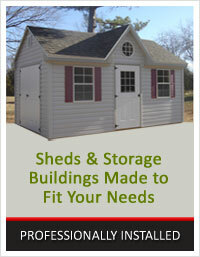 A-1 Portable Buildings offers 3 different varieties of Buildings. 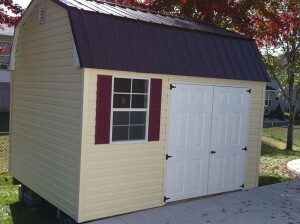 Vinyl Buildings are great for those that want to match up with their house because of sub-division requirements, ect. It comes in 13 different colors along with shingle roof (13 colors) or metal roof (18 colors) to make for a perfect match. Features like windows & shutters will greatly enhance looks. This is the best looking Building we have to offer that requires little to no maintenance. 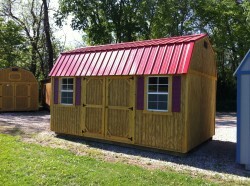 Painted Wood Buildings are one of the most popular & economical buildings that we Build. This is true for several reasons. It comes with a 50 yr. siding & trim along with a high quality 15 Yr. Sherwin Williams Paint (15 colors). Built and framed the same as the Vinyl Buildings it’s basically the same except for the siding & trim. It will give you years of virtually no maintenance. 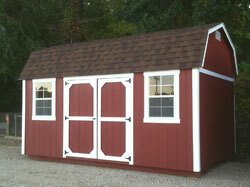 These Buildings will also come standard with shingle roof (15 colors) or metal roof (18 colors) of your choice. Pressure Treated Buildings are the perfect choice for a country like setting with lots of trees, natural surroundings, lake side, or even a back yard with lots of trees. Again these buildings are built the same except for the siding & trim being the main difference. The siding & trim are pressure treated and then sealed with a weather proofing sealer. 3/4″ tongue & groove flooring is also a standard feature in these buildings . A shingle roof (15 colors) or metal roof (18 colors) of your choice is also standard with these buildings. 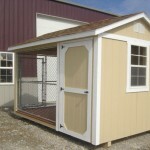 The Dog Kennel is a great for home owners who like a neat, attractive and clean environment for their pets. A Dog Kennel will also have room for extra storage as well. It is built with composite decking and treated flooring for easy washing and clean up. A dog door and box inside makes it easy for feeding and general care for your pet. Custom Buildings & Projects are also our available upon request such as different sizes & styles or even a building built right on your property if we cannot deliver. For example you may need a bigger garage that we commonly build and deliver or you want your garage built & framed on a concrete foundation. These custom projects are only limited by your imagination! Not sure what we can do for you? Call us or better visit one of our Dealers. As with all our buildings, we have set a standard of quality & detail for every building we manufacture that puts it above ordinary Portable Buildings. Our Goal is to produce buildings above our customers expectations which makes for satisfied customers who can enjoy their buildings for years to come.